In the past 9 years I had at least 20+ shops and (side) businesses. One more successful than the other, some were really fun and some very unrealistic. I’ll highlight a few and share what I’ve learned. 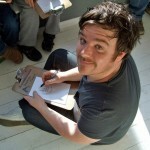 Ankepanke started with designing logos and now expanded into illustration, graphic design and font design. I primarily work with small business owners, specifically webshops, but I’ve also designed for bigger companies; WoDoe book for Sanoma, temporary tattoos with Tattly, gift wrapping paper for Ompak, premature baby milestone cards with Celebrate the Little Steps, backpacks with Madpax and so on. 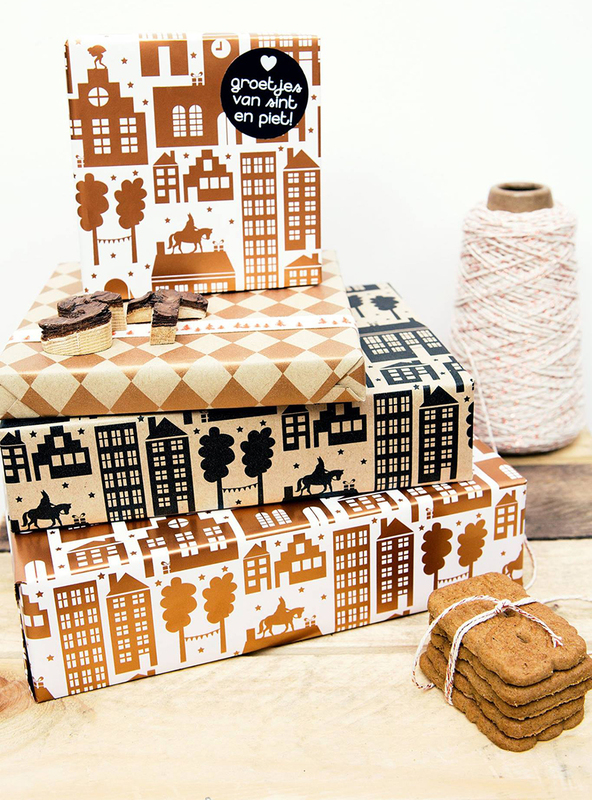 Ompak Sinterklaas gift wrapping paper. Ankepanke is my main company in which I’ve been active all these years. There are busy periods in which I have to say no to certain assignments and other times I can really focus on my side businesses. I’d call it a success, because I can afford the luxury to turn down assignments and have really built a name for myself. I’m now asked for my expertise, and not because clients are looking for ‘just any’ designer. I also don’t need to go looking for new clients, thanks to word of mouth and social media. My very first business attempt was Oekies and boy did I learn from that. Oekies were little characters on cards, shirts, badges, key chains and more. I invested a large sum of money but the shop didn’t take off at all. I didn’t have a clue what I was doing then. So eventually I quit and sent everything to charity. Only the cards are still ‘active’ at Kaartje2go (a Dutch online card shop). When snail mail started gaining popularity, I also caught the bug but took it a step further and set up Snailmail Magazine, because two of my favorite things are making books and inspiring people. The timing, medium and price were spot on, I’d call it an ‘instant success’. Every day I was packing orders and the magazine appeared in various media. I published four more magazines and designed stationery. 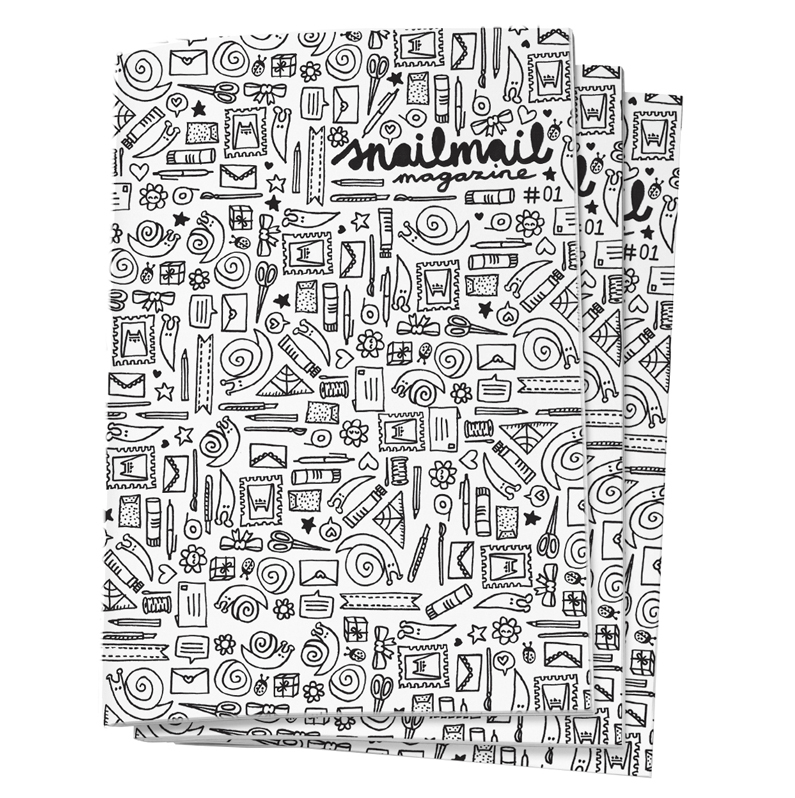 Then I fell out of love with snail mail and the specific style. It was time to let go and I sold the shop. Not having anything to compare it with, I was happy with the deal and Manon and Laura are still doing a great job with it now. What seemed like a really good idea and so much fun but didn’t turn out to be viable: a Dutch quarterly DIY magazine with a different theme for each issue. For MAAK Magazine I worked with three other ladies and we published 8 issues. It was well received and nearly all issues sold out. However, four very different characters working together didn’t turn out as smooth as we would have liked. It was a fun project to work on though and now I look back on it with a positive feeling. Wow, Happy Wrapping really is my biggest flop ever and it took me quite a while to get my confidence back after this project. A great example of doing everything right yet not being successful. I designed themed gift packages with paper, stickers and cards. 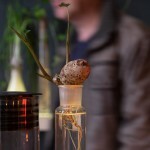 Hired someone to write press releases and launched on Flavorites Live (a Dutch event). I maybe sold ten items in three days. What went wrong? Not a clue. The price was good, it got coverage in big magazines and blogs and the website was perfect. The only thing to do was let it go and so I did just that. 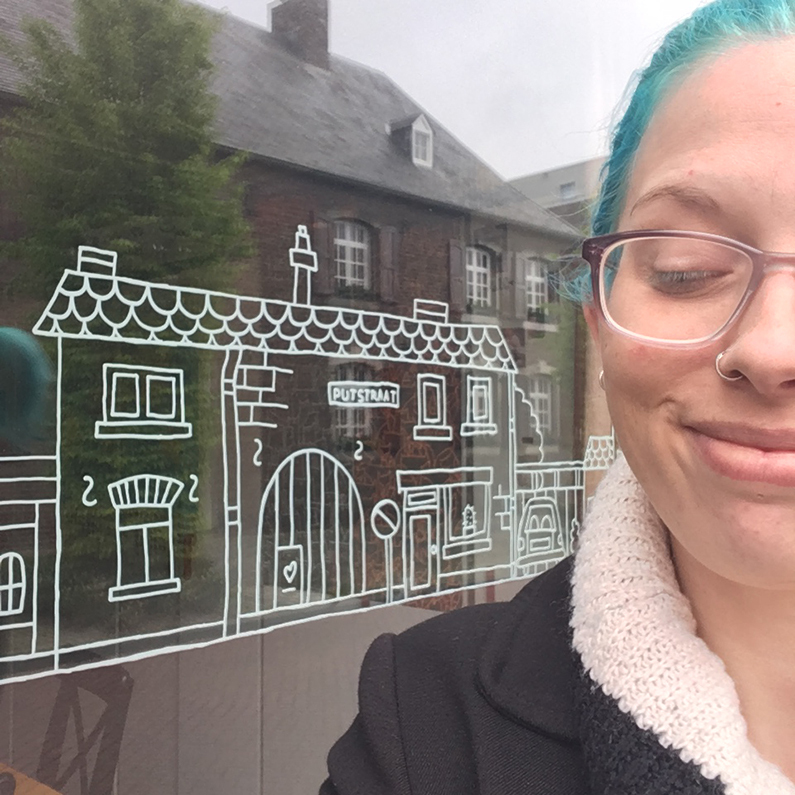 Raamtekening (Windowdrawing). Photo by JanitaJ. 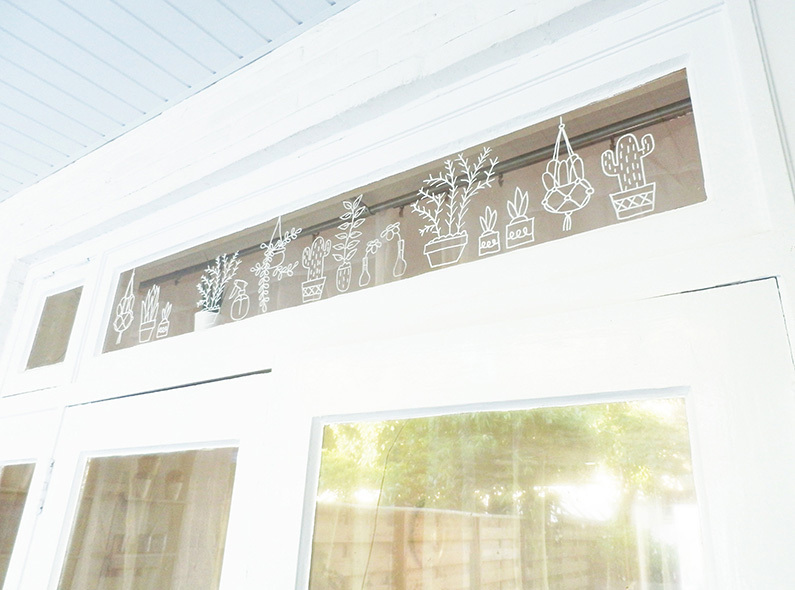 My biggest succes is Raamtekening / Windowdrawing. But it wasn’t an instant succes! Orders barely came in for the first six months but after that it really took off. Let’s just say I can’t complain ;) Again I hired someone to write a press release and this time there was a lot of coverage. It got picked up by bloggers (some at their own initiative, some I did write and send examples to). Orders exploded during the holidays, so great! Also I was really active on social media. 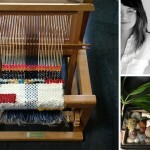 Not a conscious choice, but a kind of community developed where people shared photos of their end results, with designs from the shop and even other designs. I also kept it really personal and communicated clearly that the shop is just one person: me. Something that also helped, I think, is continuing to add new designs to the shop. I ask people on a regular basis if they think something is missing and try to focus on that. I was also the first to develop this idea and that probably helped too (although that isn’t the case anymore). The shop started out just selling digital printables. All I had to invest was time and there was no need for stock. But people kept asking for window markers and even though I didn’t want to at first, I started to sell them and noticed a jump in sales straight away. Even though I’m not the cheapest and not on top of Google’s ranking with these markers, I still notice that people want to buy them from me, even apart from the printables. So now I’ve expanded the range even further. What I personally love about the shop, is that it allows me to use my creativity and it continues to be interesting. Looking toward the future, even if window drawing becomes less popular, I’m already adding new products to the shop. Related to the existing range but also as separate products. So that was my business story. I hope you found it an interesting read. Invest, but not too much! Seriously, it seems like a good idea to order 1.000 copies of your product because then they are cheaper apiece. But every step has its own risks and no matter how great your idea is, it can always go two ways. So order a smaller batch. Maybe you strike even or make a tiny profit but at least you won’t be stuck with a huge amount of stock. Outsource. As a designer, shops that don’t invest in good branding annoy me, it just doesn’t look professional! I had to learn that too. Look at it this way: if you don’t take yourself seriously, why should others? If you don’t think your shop/business is worth investing in, then you’re lacking in faith. 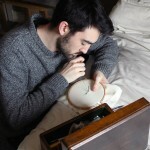 For example, I can’t take decent photographs (dark home, don’t have the right equipment) so I outsource my product photography. It’s an investment which doesn’t show straight away financially, but remember that you can always keep reusing good photos. And taxes! I hired a bookkeeper from the start. It costs money but I don’t have to think about it and there’s always someone to answer any questions. I really wouldn’t be without. No succes doesn’t mean you’re not good (enough). Customers are fickle and what sells varies. You can do everything right and stil get zero exposure. This is what I wrestled with a lot, with Happy Wrapping, because I couldn’t learn from it and therefor couldn’t improve or grow. Succes is subjective. One person wants to make a minimum amount of money, while another want as many followers on social media as possible. Decide what succes means to you personally and ignore what other people say. It has to be fun. Don’t do anything that makes you unhappy. A big part of (creative) entrepreneurship is HARD work and if you don’t like what you do, it just makes things unnecessarily difficult. Make proper agreements. Do collaborate if you feel that you can add value to each other’s business, but make sure everything is down on paper to prevent future disagreements. Be open. Overall, I’m really open about everything and will usually answer any questions. But when you’ve developed your own unique process or technique, don’t just share it with everyone. I found that out the hard way unfortunately. Remain sceptic/realistic. Proposals from other (bigger) parties often don’t get realised. Maybe I was unlucky but my own experience is that 8 out of 10 proposals fall through: A publishing firm was interested in Maak Magazine, a well-known firm wanted me to design something for them and someone wanted to buy the Oekies, but everything fell through. So enjoy when someone is genuinely interested (which is a compliment anyway), but wait until everything comes through before you start cheering. Born in the summer of 1981, I live in the south of the Netherlands with my sweet boyfriend (and soon two little kittens). I’m always working on something creative. It’s my work but also how I relax. I love to design for children, to inspire others, letters and for some reason I can’t stop drawing cats. In de afgelopen 9 jaar heb ik zeker 20+ verschillende shops en sub-ondernemingen gehad. De een succesvoller dan de ander, soms ontzettend leuk, soms niet helemaal realistisch. Ik zal er een paar uitlichten en daarna vertellen wat ik er van heb geleerd. Ankepanke begon met logo’s en is uitgegroeid tot illustratie, grafisch, patroon en font ontwerp. Ik werk vooral met kleine ondernemers, specifiek webshops, maar heb ook voor Sanoma het WoeDoeBoek ontworpen, tijdelijke tattoos met Tattly, sinterklaas kadopapier voor Ompak, prematuur baby mijlpaalkaarten met Celebrate the Little Steps, rugzakken met Madpax, enzovoorts. Ankepanke is mijn hoofdbedrijf en hierin ben ik alle jaren actief geweest. Er zijn periodes waarin ik het druk heb en opdrachten moet weigeren en andere keren kan ik me juist focussen op mijn andere ondernemingen. Wat mij betreft is het succesvol, want ik heb de luxe om opdrachten niet te doen en ik heb er inmiddels een naam mee opgebouwd. Mensen vragen me om mijn expertise, niet omdat ze ‘gewoon een ontwerper zoeken’. Ook hoef ik niet (meer) aan acquisitie te doen, dankzij mond-tot-mond reclame en social media blijven de opdrachten binnenkomen. Mijn allereerste poging tot een onderneming was Oekies en oh, wat heb ik daarvan geleerd. Oekies waren karaktertjes op kaarten, shirtjes, buttons, sleutelhangers, en dergelijke. Ik investeerde een behoorlijk bedrag, maar vervolgens liep de shop helemaal niet. Ik had toen nog géén idee waar ik mee bezig was. Uiteindelijk ben ik daarmee gestopt en heb ik de voorraad naar een goed doel gestuurd. Alleen de wenskaarten op Kaartje2go zijn nu nog ‘actief’. Toen snailmail populair begon te worden, werd ook ik in de hype meegesleept. Maar ik ging nog een stapje verder en begon het Snailmail Magazine, want mijn twee favoriete dingen om te doen zijn boeken maken en mensen inspireren. De timing, medium en prijs waren precies goed, dus dat kan ik wel een vrij ‘instant succes’ noemen. Elke dag was ik bezig met bestellingen en het magazine verscheen in verschillende media. Ik bracht nog vier andere magazines uit en ontwierp briefpapier, agenda, stickers, enz. Toen raakte ik uitgekeken op snailmail en de specifieke stijl. Het was tijd om los te laten en ik verkocht de shop. Ik heb geen vergelijkingsmateriaal, maar ik was tevreden over de deal en Manon en Laura zijn er nog steeds goed mee bezig. Een ontzettend goed idee en het leek me zo leuk, maar uiteindelijk niet haalbaar: een Nederlands kwartaal DIY magazine met elke editie een ander thema. Voor MAAK Magazine werkte ik samen met drie andere meiden en we brachten 8 edities uit. Het werd goed ontvangen en bijna alle edities waren uitverkocht. Met vier verschillende karakters samenwerken bleek niet even soepel te gaan als we zouden willen. Het was een ontzettend leuk project om aan te werken en nu kijk ik er zeker positief op terug. 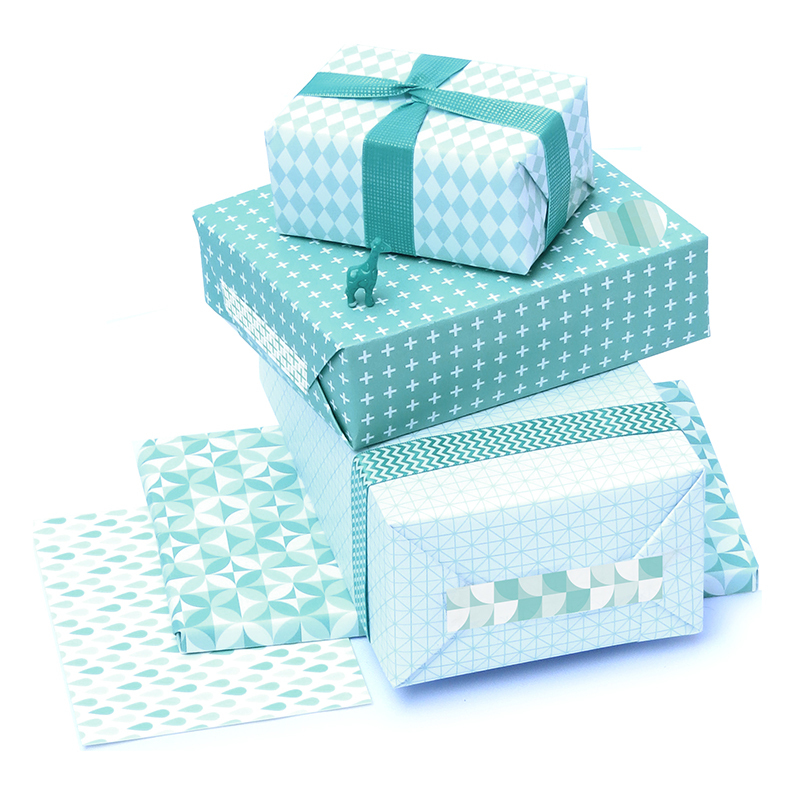 Wauw, Happy Wrapping is toch wel mijn grootste flop en het heeft even geduurd voordat ik weer het vertrouwen in mezelf had terug gevonden na dit project. Een mooi voorbeeld van alles precies goed aanpakken, maar toch niet succesvol zijn. Ik ontwierp kado-pakketten bestaande uit papier, stickers en kaartjes op thema. Ik liet een persbericht schrijven en lanceerde het op Flavourites Live. Hier heb ik misschien 10 verkopen gehad in 3 dagen. Waar het aan lag? Geen idee. De prijs was niet te hoog of laag, ik had in allerlei grote magazines en op blogs gestaan en de website was perfect. Het enige wat ik kon doen en heb gedaan, was het loslaten en doorgaan. Mijn grootste succes is Raamtekening. Maar niet meteen hoor! Ik had het eerste half jaar nauwelijks bestellingen, maar in de tweede helft steeg dat explosief. Laten we zeggen dat ik niet kan klagen ;) Ik liet weer een persbericht schrijven en dit keer had ik echt veel publicaties. Het werd ook door veel bloggers opgepikt (half op eigen initiatief, anderen heb ik aangeschreven en gratis samples gestuurd). Met de feestdagen liep het storm, echt super om te zien! Ook heb ik veel op social media gedaan. Het was geen bewuste keuze, maar het werd een soort community. Mensen deelden hun foto’s van de eindresultaten, of het nou een ontwerp van de shop was of niet. Daarnaast heb ik het heel persoonlijk gehouden. Duidelijk gecommuniceerd dat ik, 1 persoon, de shop ben. 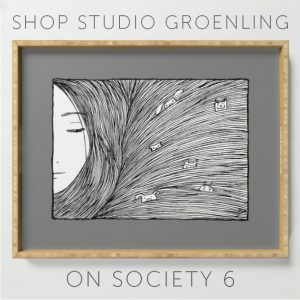 Wat ook helpt, denk ik, is continue nieuwe ontwerpen toevoegen aan de shop. Ik vraag regelmatig aan mensen of ze iets missen en probeer daar op in te spelen. Ook ben ik de eerste met dit idee en dat zal waarschijnlijk ook wel een rol spelen (alhoewel dat inmiddels niet meer het geval is). De shop begon met alleen digitale producten (printables). Dan hoefde ik alleen tijd te investeren en zat niet met een voorraad. Maar mensen vroegen om krijtstiften en hoewel ik het eerst eigenlijk niet wilde, ben ik er toch mee begonnen en ik merkte meteen een stijging in de verkoop. Ondanks dat ik niet de goedkoopste ben en ook echt niet bovenaan sta op Google met krijtstiften merk ik toch dat veel mensen ze, ook los van de raamtekeningen, bij mij kopen. Om daar verder op in te spelen heb ik het krijtstift-assortiment verder uitgebreid. Het fijne aan de shop, voor mij persoonlijk, is dat ik mijn creativiteit er in kwijt kan en er niet snel op uitgekeken raak. Ik kan met stijlen experimenteren en nieuwe dingen bedenken. Met het oog op de toekomst, mocht de populariteit van raamtekeningen minder worden, ben ik bezig nieuwe producten aan de shop toe te voegen. Deze zijn gerelateerd aan raamtekeningen, maar ook op zichzelf staand. Investeer, maar niet teveel! Serieus, het lijkt een goed idee om meteen 1000 stuks van je product te laten maken, omdat het per stuk goedkoper is. Maar elke stap heeft zijn risico’s en hoe goed je idee ook is, het kan altijd twee kanten op gaan. Dus laat eerst een kleiner aantal drukken. Misschien speel je quitte of je hebt een kleine winst, maar je blijft tenminste niet met een mega voorraad zitten. Besteed uit. Als vormgever stoor ik me regelmatig aan shops die niet investeren in een goede huisstijl of (product)fotografie, het ziet er gewoon niet professioneel uit! Dit heb ik ook moeten leren hoor. Bekijk het zo: hoe willen mensen je serieus nemen als je het zelf niet doet? Als je vindt dat je shop/onderneming het geld niet waard is om in te investeren, dan mis je het benodigde vertrouwen of geloof er in. Ik kan bijvoorbeeld niet goed fotograferen (ik woon in een slecht verlicht huis en bezit gewoon niet de juiste apparatuur), dus productfotografie besteed ik uit. Het is een investering die je niet meteen terugziet, maar bedenk dat je goede foto’s kunt blijven gebruiken. Of de belastingen!Ik heb vanaf het begin een boekhouder gehad. Dat kost geld, maar ik hoef er niet over na te denken en heb altijd een contactpersoon waar ik met vragen terecht kan. Ik zou echt niet zonder willen. Geen succes betekent niet dat je niet goed (genoeg) bent. Klanten zijn wispelturig en wat goed loopt varieert. Je kunt alles goed aanpakken en nog steeds geen stip op de radar zijn. Hier heb ik met Happy Wrapping veel mee geworsteld, omdat ik er niet van kon leren en daarom niet verbeteren/groeien. Succes is subjectief. De een vindt dat je minimaal een X bedrag moet verdienen, terwijl de ander juist liever zoveel mogelijk volgers op social media heeft. Succes voor mezelf is, dat ik het leuk vind en er mijn geld mee kan verdienen. Beslis wat het voor jou betekent en negeer wat anderen zeggen. Het moet leuk blijven. Doe niet iets waar je diep ongelukkig van wordt. Een groot deel van (creatief) ondernemerschap is HARD werken en als je het niet leuk vindt, maakt dat het alleen maar onnodig zwaar. Maak goede afspraken. Ga zeker samenwerkingen met anderen aan als je elkaar aanvult, maar zorg dat afspraken duidelijk op papier staan om toekomstige verwarringen/disputen te voorkomen. Openheid. Ik ben over het algemeen heel open en als ik vragen krijg zal ik die meestal gewoon beantwoorden. Maar heb je je eigen werkwijze verzonnen, deel die dan niet met iedereen want sommige mensen maken daar misbruik van. Deze les heb ik helaas moeten leren. Blijf sceptisch/realistisch. Voorstellen van andere (grotere) partijen gaan vaak niet door. Misschien heb ik pech gehad, maar mijn ervaring is dat 8 van de 10 keer ideeën niet doorgaan. Er was eens een uitgeverij geïnteresseerd in het Maak magazine, een bekend bedrijf wilde dat ik iets voor hun ontwierp en iemand wilde de Oekies overnemen, maar het is allemaal niet doorgegaan. Dus vier het als iemand geïnteresseerd is (want dat is sowieso een compliment), maar wacht af tot het helemaal rond is voordat je echt juicht. Over Anke. Geboren in de zomer van 1981, ik woon in het zuiden van Nederland met mijn lieve vriend en over een niet al te lange tijd ook twee katjes. Ik ben altijd met iets creatiefs bezig. Het is mijn werk, maar ook hoe ik me ontspan. Ik ontwerp graag voor kinderen, om mensen te inspireren, letters en om een of andere reden kan ik niet ophouden met katten tekenen.